Calling all burgeoning Directors, Cinematographers, and anyone interested in upping their film skills! 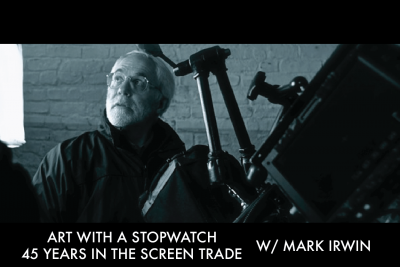 Join us on Saturday, November the 10th for “Art With a Stopwatch – 45 Years in the Screen Trade w/ Mark Irwin.” This 5 hour workshop will give filmmakers a crash course on cinematography from one of the best (including a Q&A session). Mark Irwin, A.S.C., C.S.C is one of Canada’s most prolific cinematographers. He is widely known for his early collaborations with David Cronenberg on films such as FAST COMPANY, THE DEAD ZONE, and THE FLY. Irwin has also been a main collaborator for several directors such as Wes Craven, Todd Phillips and The Farrelly brothers, and has acted as the Director of Photography for such fan favourites as THE MASK, DUMB AND DUMBER, OLD SCHOOL, 10 THINGS I HATE ABOUT YOU, and SCREAM. He is a four-time recipient of the CSC Award for Best Cinematography in a Theatrical Feature, and a Genie Award nominee.